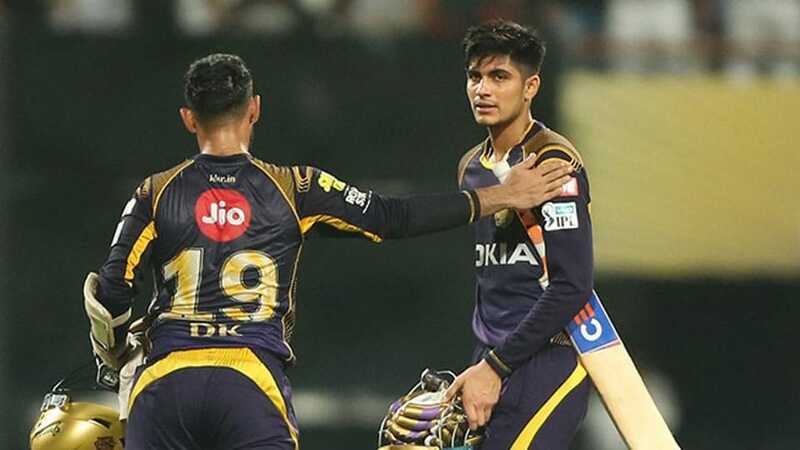 Kolkata: Shubman Gill and Dinesh Karthik complemented the efforts put in by Kolkata Knight Riders (KKR) spinners as the home-side eased to a six-wicket win over Chennai Super Kings (CSK) at Eden Gardens on Thursday. Winning the toss and electing to field first, Karthik got the perfect response from his bowlers as they restricted Chennai Super Kings to 177/5 in 20 overs, which looked to be below par given the conditions. Sunil Narine was the star with the ball, picking 2/20 in his four overs which included the big wickets of in-form Shane Watson and Ambati Rayudu. Watson and du Plessis again started well, putting on 48 runs for the first wicket before Piyush Chawla removed du Plessis with a fine googly. Suresh Raina showed glimpses of form as he scored a fine 31 before Kuldeep Yadav accounted for him. Watson too was dismissed for 36 as none of the CSK batsmen made the most of their starts. Dhoni stayed unbeaten on 43 off just 25 balls which helped the team finish at 177/5 in their 20 overs. Narine was well supported by Chawla 2/35 and Kuldeep 1/34, as the spinners kept a leash on CSK batsmen. However, in the second innings, CSK’s spinners failed to replicate that effort. Lynn was dismissed in the first over by Ngidi after a couple of lusty blows. However, Jadeja dropped Narine twice on two balls and the West Indian made him pay as he scored 32 off just 20 balls to provide the perfect start. Uthappa and Narine departed in quick succession as CSK looked to stage a fight back. Young Gill showed his class as he scored an unbeaten 57 off just 36 balls to ensure KKR don’t face any further stutter. He was timing the ball beautifully and finding boundaries at will. Dinesh Karthik played the role of a finisher perfectly as he scored a quickfire 45 off just 18 balls, at a strike-rate of 250. None of the Chennai bowlers really seemed to trouble the KKR batsmen, with Harbhajan’s 1/20 in 3 overs being the standout performance. The win moves KKR to third spot with 10 points, also giving them some breathing space from chasing pack. CSK meanwhile dropped to the second spot. Sunil Narine was chosen as the Player of the Match.